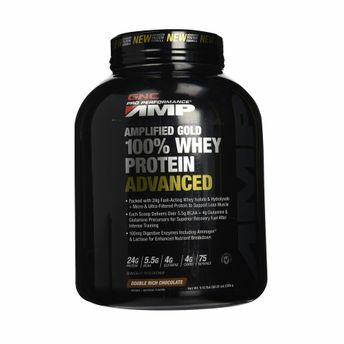 The premium formulation of GNC 100% Whey Protein Amp Gold Advanced Chocolate Powder begins with using Whey Protein Isolate (WPI) as the leading protein source. Packed with 24 grams of fastest acting lean muscle-building protein and filter out impurities to provide you with clean performance fuel that has significantly less cholesterol, sodium and fat levels. This amazing-tasting performance fuel has up to 38% more branched chain amino acids, plus key enzymes and vital nutrients to maximize amino acid absorption.